There do exist collectors who are working their way through John Bulat's Podillia Trident listing, trying to get one of every separately listed variety. The listing starts at # 1370 and ends at #2195 (plus an Appendix which runs from #2196 to 2283, plus a, b and c varieties here and there ...). So it's a very big project - and I don't know anyone who has completed it. The late Ron Zelonka once sent me his Podillia Wants List. It was actually quite long. Maybe I found three or four stamps for him. 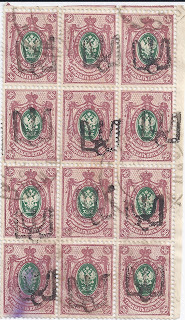 Both mint and used stamps can be used. Have a look above. 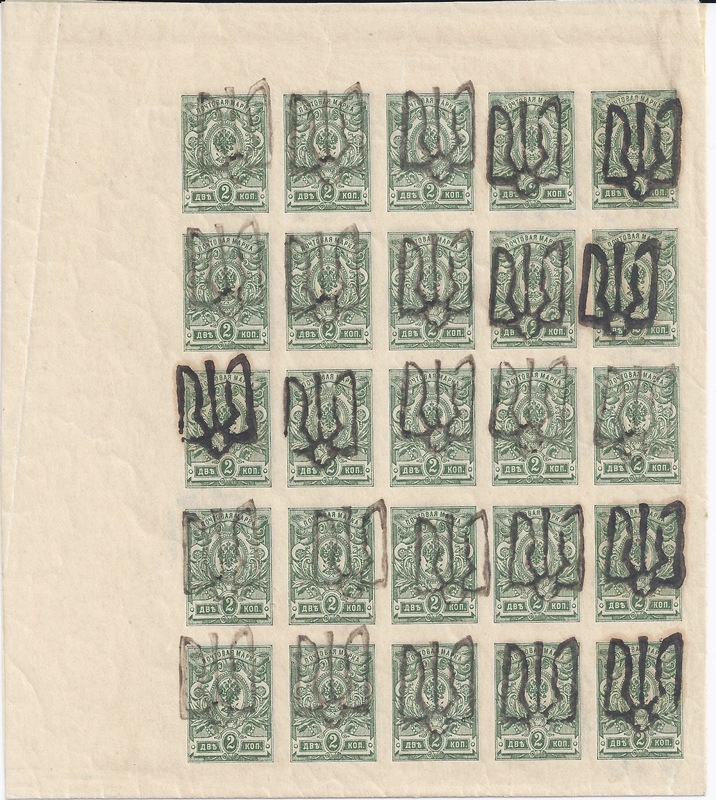 The block of 25 mint stamps shows Trident Type 14b (Bulat # 2075). The clerk (probably left-handed) worked from right to left across four rows and from left to right in the middle row. In every case he re-inked the handstamp every fifth strike. This means that the block shows us quite clearly the sorts of difference you get between well-inked and lightly inked examples of this Trident. In this particular case, unusually for a wooden handstamp, there is not a lot of variation which is why 14b is an Easy trident to collect. 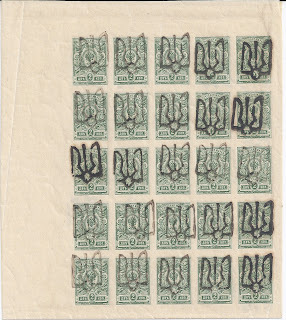 The block of 12 used stamps shows Trident Type 8a (Bulat # 1603). This is also a wooden handstamp and, again, it is quite distinctive. In the block above there is a particularly clear strike in position 5 of the block - you could trace this one quite clearly. It helps that this block is very lightly cancelled. 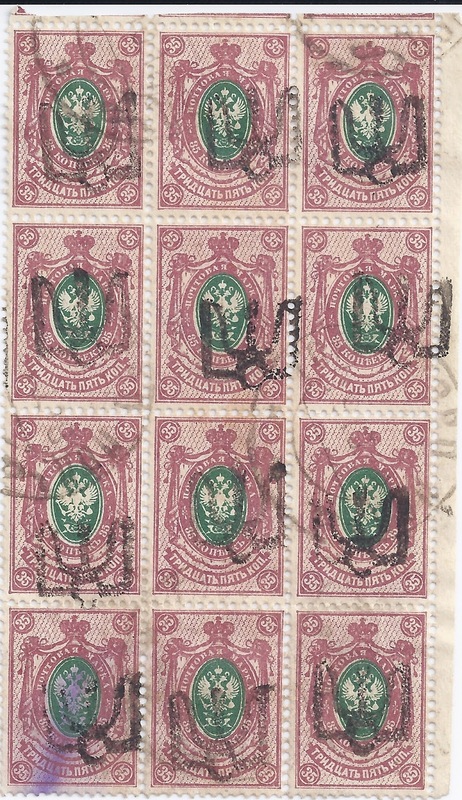 In both these cases, you could put the blocks in the centre of an album page and show other denominations with the same Trident around them - and always using the block at the centre of the page to check the identification of what will often be single stamps. Thanks for the sample post. It is always hard to find a catalog with color Podillia listed. But also in a variety which helps an avid collector like myself, to see the differences between wood,metal and rubber stamping. Also to avoid forgeries.